Actually go sailing, not just for an hour or two, but 5-6 hours for a chance at some good wind. Spend the day on the water and exploring new areas off the coast of Maui. Be on a smaller boat with an intimate group of people. After we did our research it became obvious that most of the sailing charters we found on Maui were big boats that accommodated large groups of tourists (50-100 people). We didn’t want a boat where we could get lost in the crowd. Sail Maui was the first place we looked into and we knew that Sail Maui was the one for us. We booked our tour online (it was really simple) and a few days later we were at the Lahaina Harbor on the dock at 8:30am ready to set sail for the day to Lana’i. 9:35am – All aboard. After a quick welcome and safety introduction, we were motoring out of the harbor on board Sail Maui’s first boat, Paragon. According to our captain, the trade winds don’t pick up until the afternoon, so we settled in with some island tunes and breakfast spread of croissants, fruit, juices, yogurt, granola, etc. 11:00am -Cruising. By this time we were still motoring past the southern coast of the island of Lana’i. The harbor was in our sights and we knew we were getting close to our big snorkel stop for the day. In the meantime, everyone was chatting, sunning and taking in the sights of Maui and Lana’i from an ocean perspective. After our brief chat with our captain here are some fun facts we found out about the Paragon. For more Specs on the Paragon visit their website: Sail Maui. It’s a concert catamaran. Originally designed as a race boat, the owner had them certified as passenger boats. 11:45am – Snorkel Time! Manele Bay is just outside the Lana’i harbor is said to be one of the best snorkeling places in all of Hawaii. Our captain informed us that this was the clearest water he had seen here in a month. We felt very optimistic as we jumped into the turquoise sea and as soon as our goggles hit the water, we were not disappointed with the view. We saw thirty different varieties of fish along with the allusive sea turtles we had been hoping to spot our entire trip. It was a magical moment, shared with only our crew and the 14 other passengers on board. 12:45pm – To The Beach. We were handed our pre-made picnic baskets and stepped off the dock to walk the ten minutes over to Hulopo’E Beach. We were so busy soaking in all the tropical views, we had to rush eating our lunch in order to make it back to the Paragon in time. After an hour at the beach it was time to head back for Maui. 2:00pm – Sails were up and the drinks were flowing. We don’t drink, but there is an open bar on board so you can order whatever you want and they will bring it out to you. We raised the sails shortly after we left the Lana’i harbor and the Paragon cut through the waves giving us a pleasant and relaxing sail home. We all tried to convince our captain to let us stay on the water as long as possible, none of us were in a rush to get back. 3:30pm – Blue Water Swim. I confess I had no idea what to expect when I read about it. Apparently, there is a small area of ocean water in between Lanai’ and Maui that is protected from the wind and from the salt. It’s the perfect place to stop the boat for and have everyone jump in for quick to cool off under the Hawaiian sun. The water is so clear you feel as if you looked hard enough you could see the ocean floor some 250 feet below. 4:15pm – Back at Lahaina harbor. You know the feeling after a long day of being out in the sun and playing on the water? We were tired but with big smiles thinking about all of the neat experiences we had just had on the Paragon. Thanks to everyone at Sail Maui, this is a sail we will never forget and we can hardly wait to do it again. Watch our video below about our Sail Maui experience. Visit their website for more info: SailMaui.com. Travelling to the Big Island? 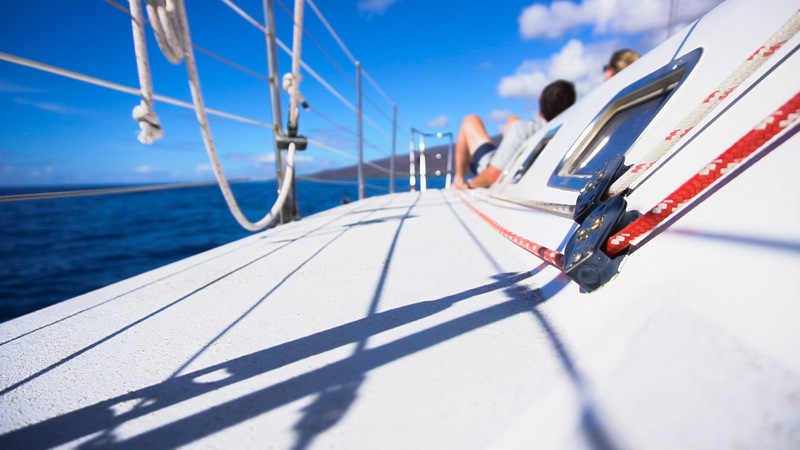 Check out our posts about Sailing and Snorkeling on Hawaii.